“Meri Jaan" (my darling) seems to be Begum Nawazish Ali’s favourite phrase, as she peppers all her sentences with the endearment, leaving the listener with a fuzzy feeling of warmth. 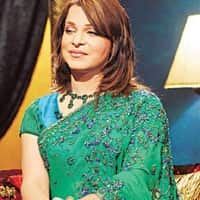 This could be how the Begum has got everyone from film directors to bureaucrats to say the most candid things on her show, The Late Night Show with Begum Nawazish Ali, or maybe it is just the Begum’s flamboyant charms. While she makes her shows look like a plot of gags, underneath the flamboyance, she means serious business. “We need to move ahead, move beyond boundaries, and rise above our differences to make progress," she says on the India-Pakistan relationship. But it is her fun side that makes her so well-loved. “I so wanted to contest the Pakistani presidency, I think my colourful saris are a better guise than his boring uniform," says the temptress, who claims she put her plans on hold because of the age limit—according to the Begum, she is only 27 years old. Charming, chatty and very candid, she tells us who she considers the hottest men in India. And the revelation comes with a footnote: “All Indian men are gorgeous, I love them all." Shah Rukh Khan: He is Shah Rukh Khan. There is something about him. He is charismatic, hot, beautiful. What else can I say, ‘meri jaan’? M.S. Dhoni: He is my latest favourite. Right now, I think everything about him is hot. He is attractive, has conviction, his temperament, his style...‘uff’. Rajiv Gandhi: He was so smart, suave and graceful. He was also soft-spoken and kind. He had all those gentle graces that a woman looks for. Milind Soman: ‘Meri jaan’, what a beautiful body! He is like candy. He has a high ogle quotient about him. Saif Ali Khan: I think it’s the ‘nawabi’ thing about him. I have always felt close associations with the nawab culture. ‘Mujhe aisa lagta hain ke mere rago mein nawabon ka khoon hain’ (I feel I have aristocratic blood in my veins).